Owner calle and stated that her yard debris has not been picked up in weeks. Thank you for submitting your concern to Chatham County Public Works. A supervisor will be assigned to review the information provided. If we cannot resolve this issue in a timely manner, you will be contacted by our staff via e-mail or phone if requested. I reported this a week ago and nothing has been done. Thank you for submitting your request to The Landings Association. A staff member will be assigned to review the information provided and work on resolving the issue. old lumber and trash debris dumped on OSCA rd. 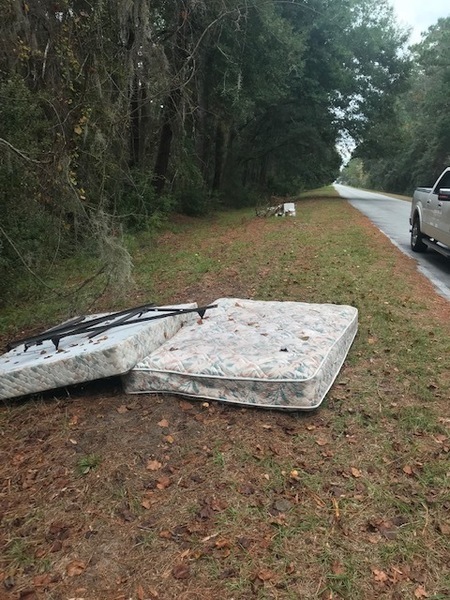 The dumping is growing down on OSCA Rd. Now a mattress, boxspring and frame. Please expedite pickup before area turns into a dump. Owner stated that Chatham County PW has not been down her street several times to collect the yard debris. She stated that she called this morning because they did not pick up again today. She was told by a lady that they probably would not come back today if they have already been in the area. Mrs. Wilber would like for Chatham County PW to collect her yard debris every week as scheduled. Mrs. Echlin stated that Chatham County PW has not picked her yard debris for the 3rd week in a row. She stated that she is very upset and she has family coming in today for Thanksgiving. She would like a returned telephone call to see if she is doing something wrong she would like to know. Her telephone number is 912-598-0566. Owner has Yates-Astro attempting to catch an armadillo for her right now. She would like for PW to set a trap starting October 1, 2018. Please call Mrs Gustein at 912-507-3165 if you have any questions. Thank you for submitting your request to The Landings Association. Staff has forwarded the information to our onsite USDA Wildlife Specialist who will be working to address the issue. Newspaper carrier called and stated that there is a wasp nest in the tube where the newspaper goes. The owner is not home and he did not want her to get stung by the wasp. Mr. Moore stated that there is an 8 ft alligator in the first lagoon on the left off Sundew Road. I voted to leave the alligator alone. They are part of the natural order and a big reason why we love our Sundew lagoon. 45 Cabbage Crossing clean-up ? Not sure who is paying the bill, but the street lamp #132 is often on during the middle of the day.